Click the questions to view the answers and click images below questions to enlarge. 1. Is the column made from ¾” x 6” thick fork lift mast sections or bent sheet metal? 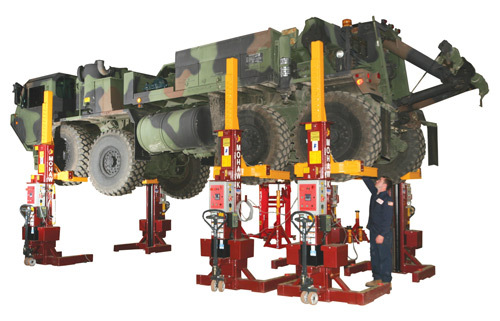 Mohawk lifts are made with fork lift masts. 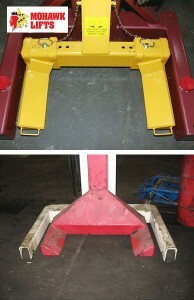 Fork Lift Masts last forever, vs. bent sheet metal which is weakened sheet metal. 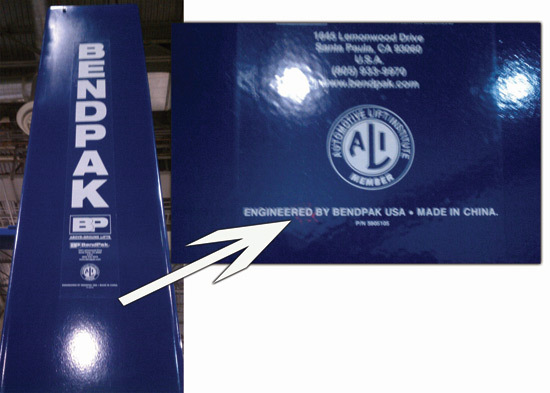 The first photo shows a Mohawk Lift on the top and an ALM brand lift at the bottom. 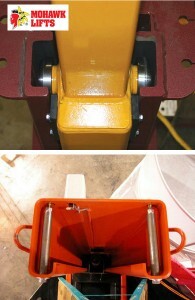 The second photo shows a Mohawk at the top and a Rotary lift on bottom. 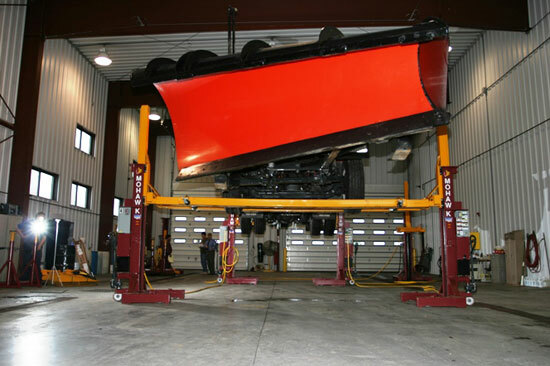 You can see that Mohawk Lifts are made with fork lift masts. 2. 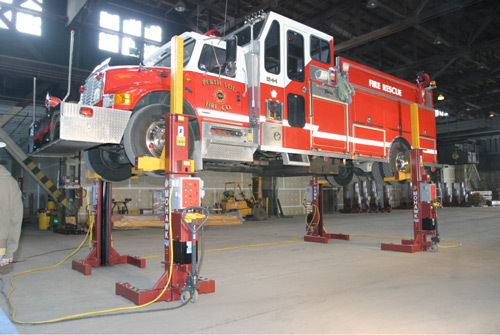 Does the lift fully “sit” on the floor with retractable wheels or are the front wheels always under load & contracting the shop floor? 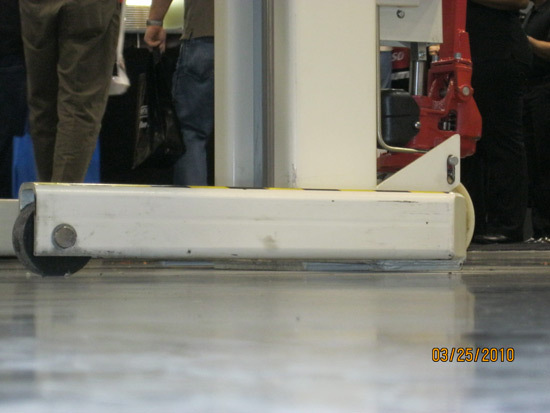 Mohawk’s mobile column distributes the load over a greater surface area with retractable front wheels spreading the load vs lifts with just “point loads” resting on their wheels. The first image shows a Mohawk mobile column that broadly distributes the load evenly. 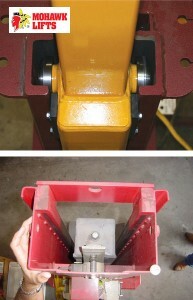 The second image shows a Steril Koni lift. 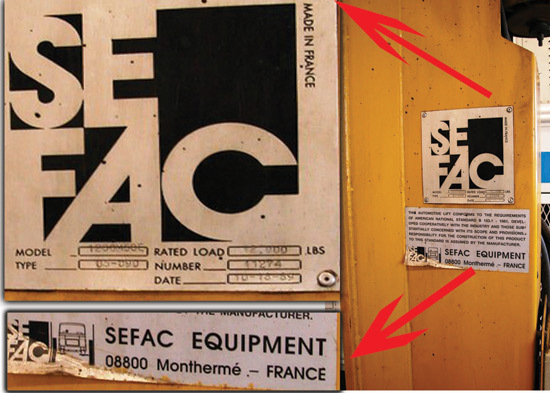 The third image shows a Sefac lift. Please note that these columns don’t sit on he floor as do Mohawks. 3. 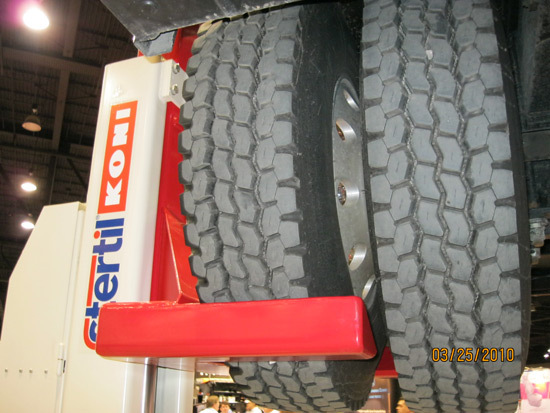 How long are the lifting forks (15” for lifting flotation tires or 22” to raise both dual rear tires)? A 12” long fork won’t fully engage a floatation tire and certainly won’t grab both rear tires. 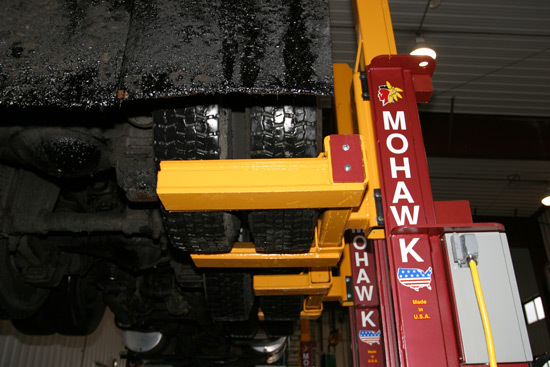 Mohawk Lifts lifting forks are able to raise both dual rear tires. The first image shows a Mohawk Lift with lifting forks lifting both dual rear tires. 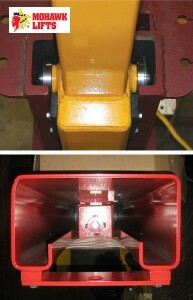 The 2nd image is a Rotary lift. 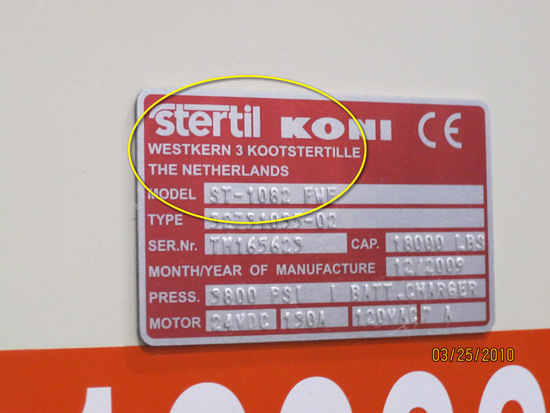 The third image is a Steril Koni Lift. 4. Are the columns & all available options ALI/ETL certified (If not then the lift is no longer certified)? 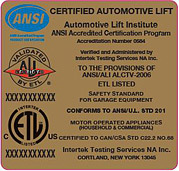 If not then the lift is no longer certified. 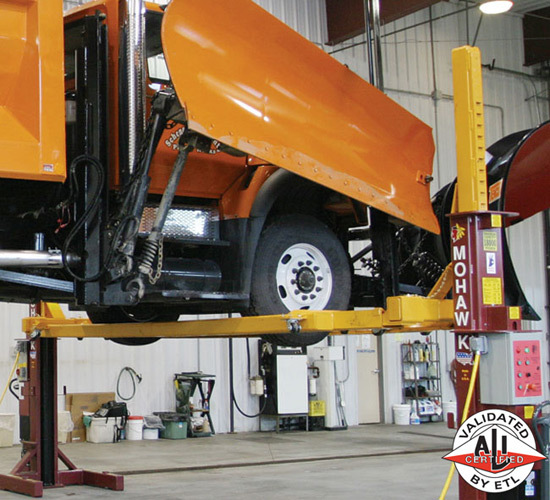 All but one of Mohawk’s mobile lift accessories are ALI/ETL certified to meet the one and only nationally recognized safety standard for vehicle lifts. Just look for the mark. 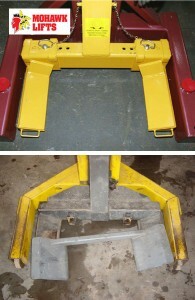 For additional information visit www.autolift.org. 5. 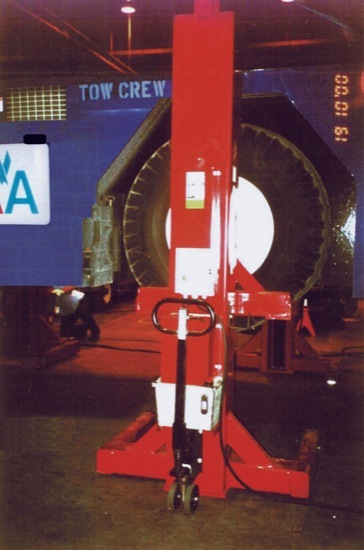 Does the column offer a weight gauge to weigh vehicles and visually assure the operator that the weight has been lowered onto the mechanical locks? If not how do you know the lift has been fully lowered on the locks? 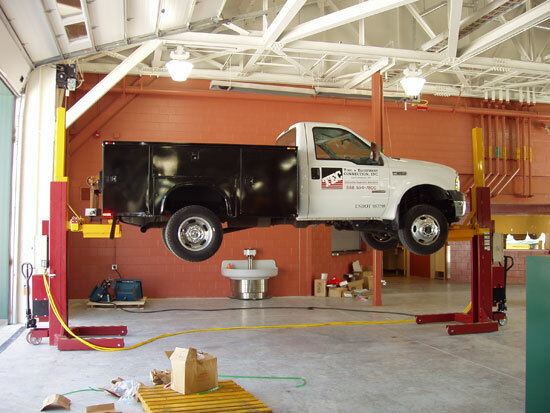 Mohawk Lifts offers an ALI/ETL certified weight gauge that aides vehicle diagnosis by measuring weight within 3% of vehicle weight. 6. 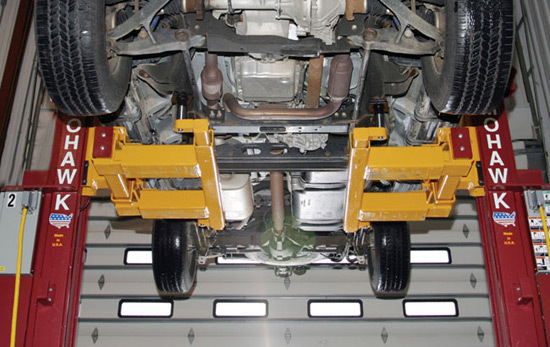 When used in pairs, does the manufacturer offer an option to raise passenger vehicles from the front to rear as well as side to side? 7. 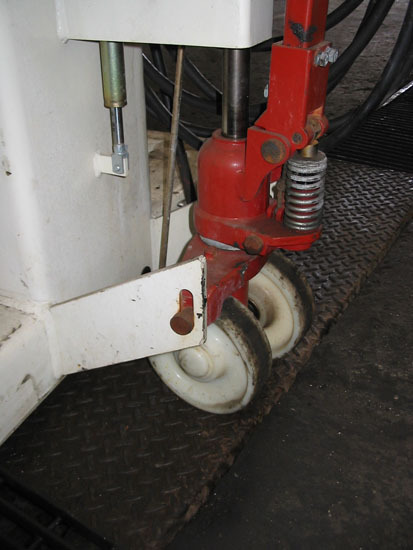 Does the lift have adjustable forks to tightly grab the tires or is an optional wheel reducer sleeve needed when raising vehicles with smaller tires? Adjustable forks can’t slip off like a wheel reducer sleeve or be forgotten as fixed forks require the reducer sleeve be added and removed. 8. 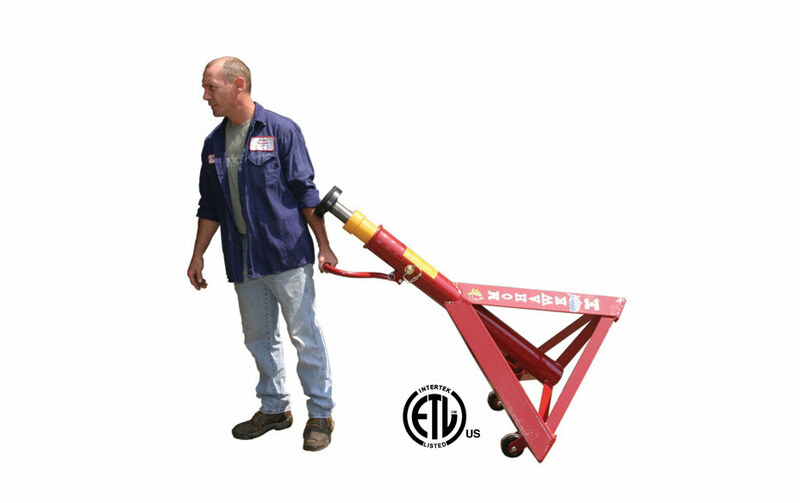 Does the lift have wing plow adaptor or RV slide out adaptor available to save labor of removing wing plows or work on RV’s with slides open? If not, plows will need to be removed (2-3 Hours) before raising a plow truck. 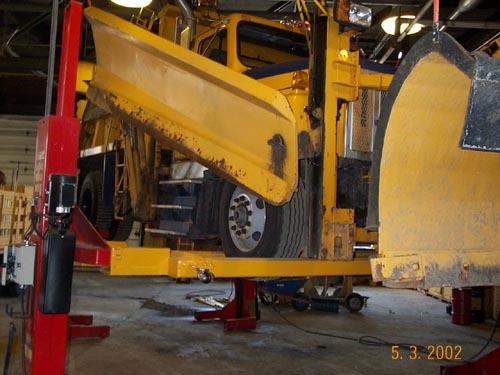 Mohawk Lifts offers a wing plow adaptor or RV slide out which allow winged snow plow trucks to be raised without removing the plow and allow RV slides to be extended and lifted. 9. 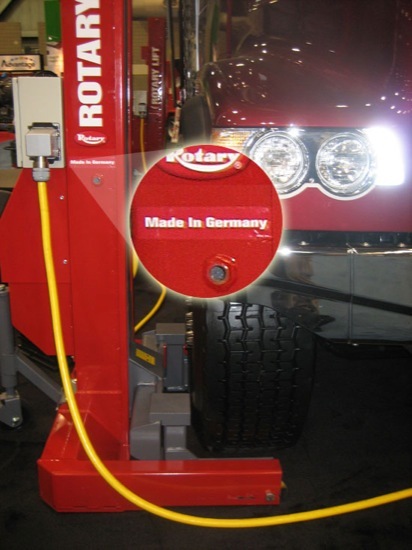 Does the standard lift accommodate a 24” rim or just a 22.5”? 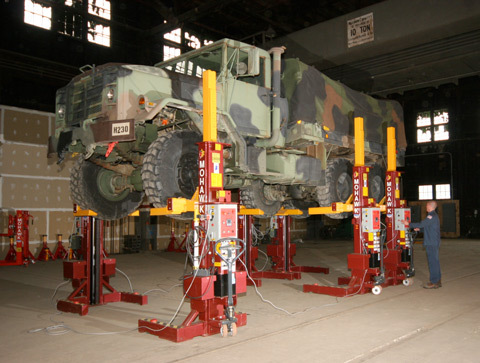 Accommodating larger rims is important for military vehicles, or vehicles with 24” rims. 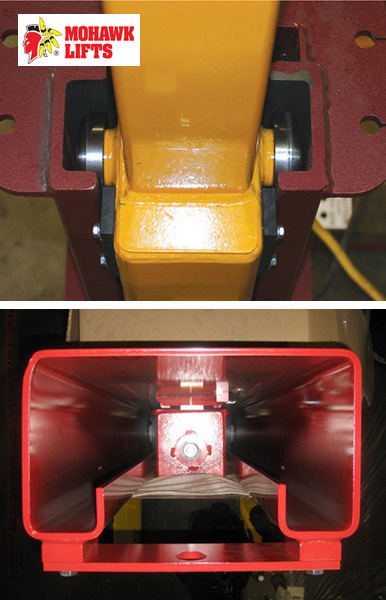 Mohawk’s standard columns accommodate a 24” rim. 10. 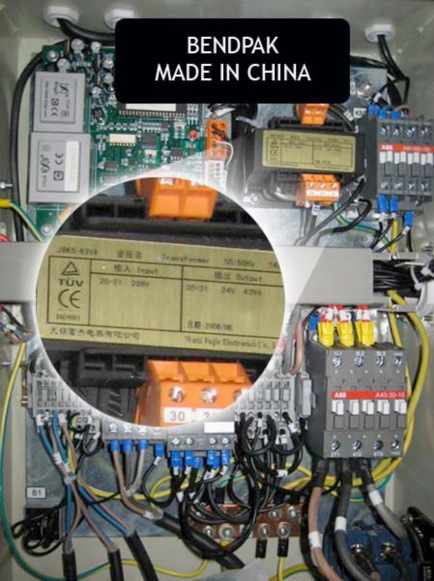 Where is the lift made (USA, China, Holland, France, Germany)? 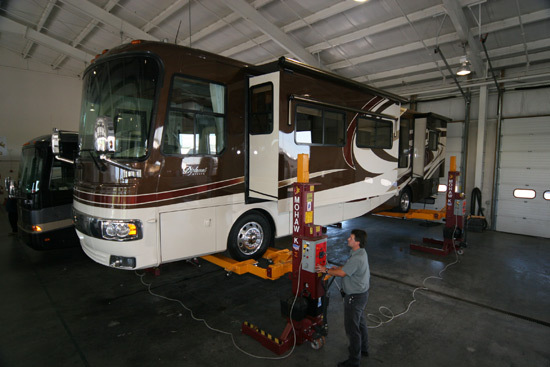 Headquartered in Amsterdam, N.Y Mohawk lifts are proudly designed, welded, and manufactured in the U.S.A. Buying American made products ensures parts and service availability, supports the U.S economy, and support the American workforce. 11. 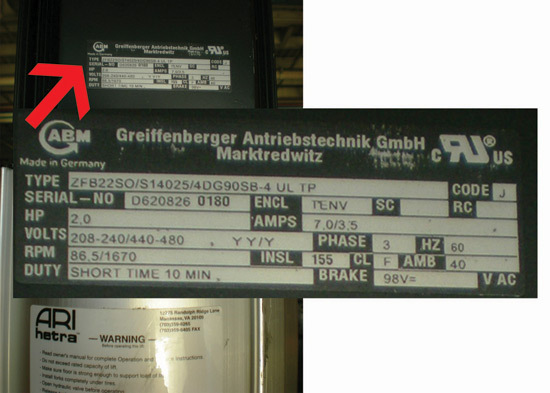 The PLC (Programmable Logic Control) which controls column synchronization: Is the PLC an “off the shelf” Siemens controller available nationwide or a dedicated printed circuit board specific to that brand of lift (expensive should replacement ever be needed, if still available)? 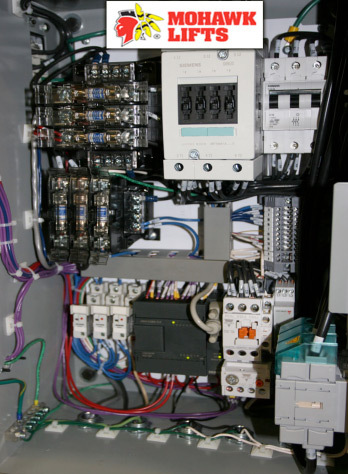 Replacements for Mohawk’s off the shelf PLC’s can always be found while dedicated circuit boards can cost $30,000 (If ever needed). 12. 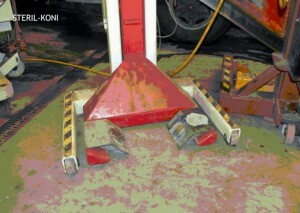 The steering wheels on the lift: A. Are they single or dual wheels? B. 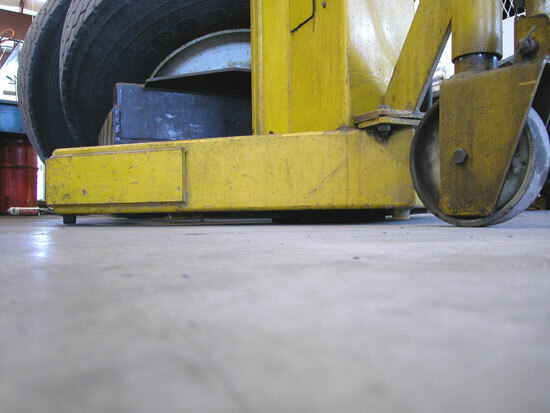 Steel or rubber coated (for ease of rolling over shop debris & expansion seams)? C. Are there roller bearings in the rear wheels to ease movement or just a bushing? 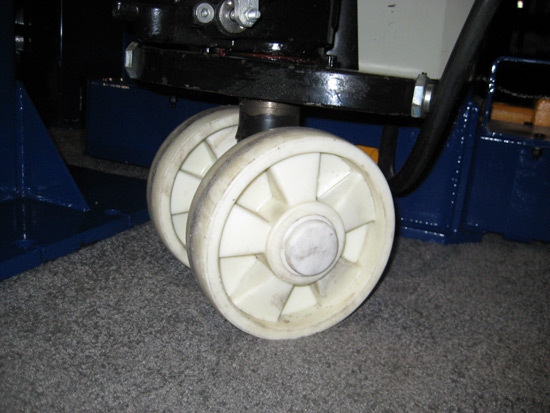 Mohawk’s dual bearing enclosed rubber coated steel wheels make the column the easiest to move and position as its rubber coating allows for easier rolling over shop debris & expansion seams. 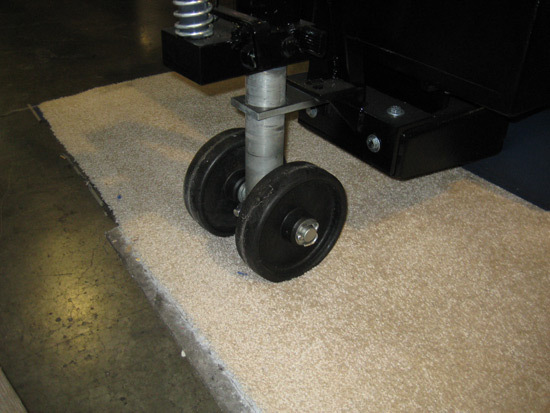 The 1st photos show Mohawk’s rubber coated dual wheels that allow for easy rolling. 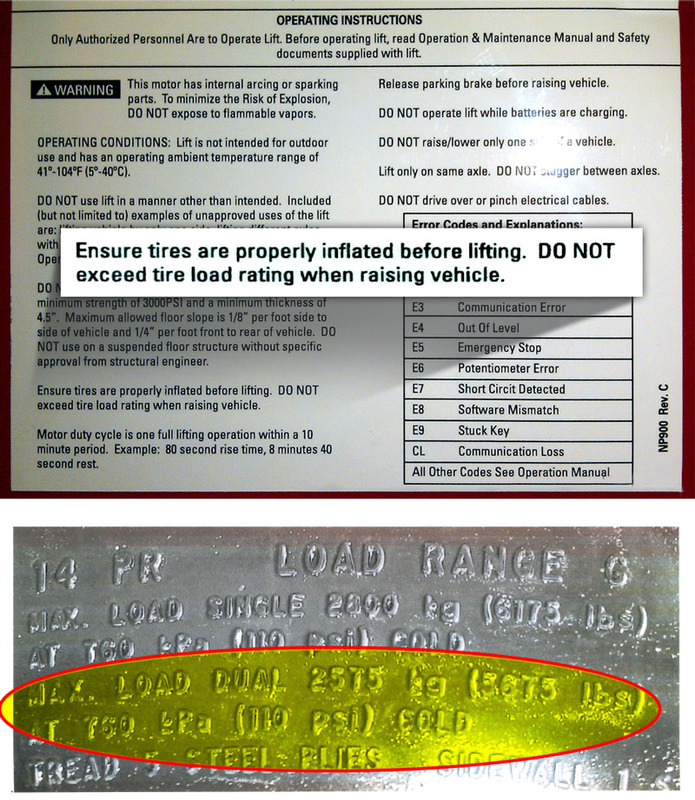 The bottom images show competitor’s plastic or steel wheels. 13. 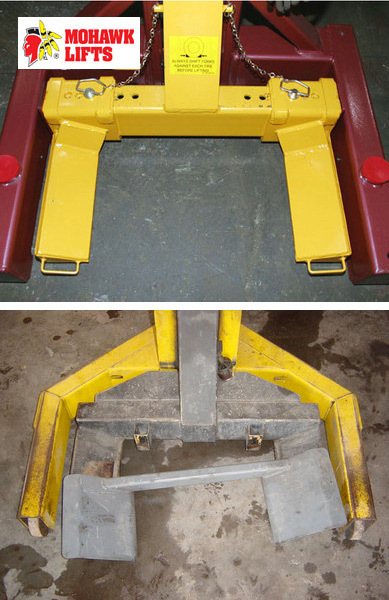 Is a slope indicator available to verify the angle of your shop floor (to avoid using the lifts on an unsafe sloped floor)? If not, is the floor perfectly flat as required by some column brands? 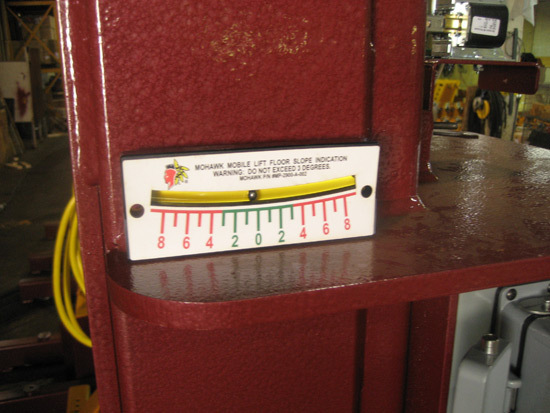 Mohawk’s slope indicator attaches to the column to display the floor slope measured in degrees. Other brands mandate level floors with no more than a .06° slope. 14. 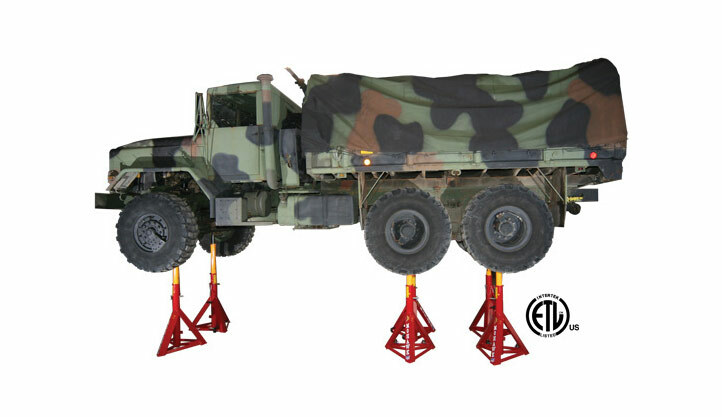 Has the US Military tested the lift, done a favorable evaluation and assigned the mobile lift a National Stock Number? 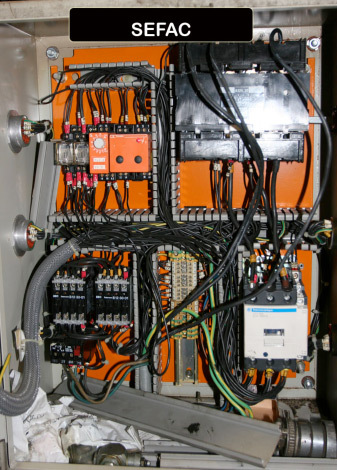 If you’ve not seen the MEEP (Management Evaluation Equipment Program) report, ask for it. 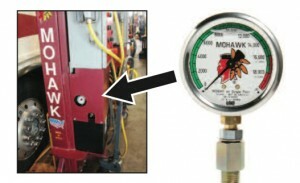 View Mohawk’s MP-18AC MEEP evaluation. 15. Can a set of 6 columns be divided up into 3 sets of 2, a set of 2 and as set of 4, does only one column act as the “main” post? If not able to be divided, you’ll never make a set of 4 into 2 sets of 2. 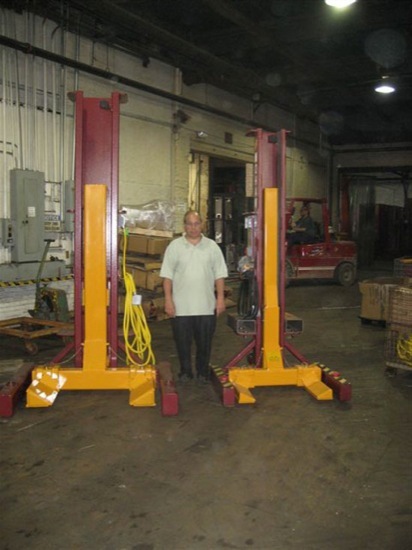 Mohawk mobile columns can operate in pairs and sold in sets of 2, 4, 6, or 8 columns. 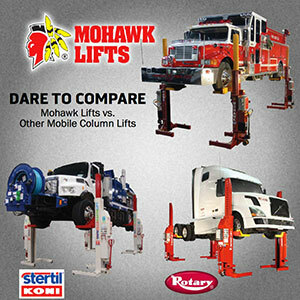 If you purchase 4 Mohawk mobile columns today you could add two columns later as your fleet grows and needs change. 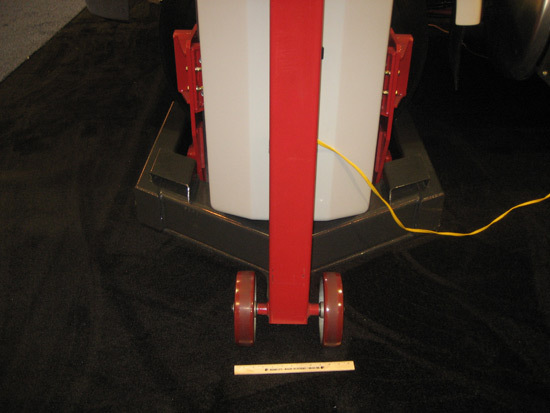 Mohawk’s paired Mobile Columns have power sources on all pairs enabling the user to divide the columns and still have power access. Some competitors only offer 1 main power post which doesn’t allow the user to divide the columns or add columns as their fleet grows. 16. 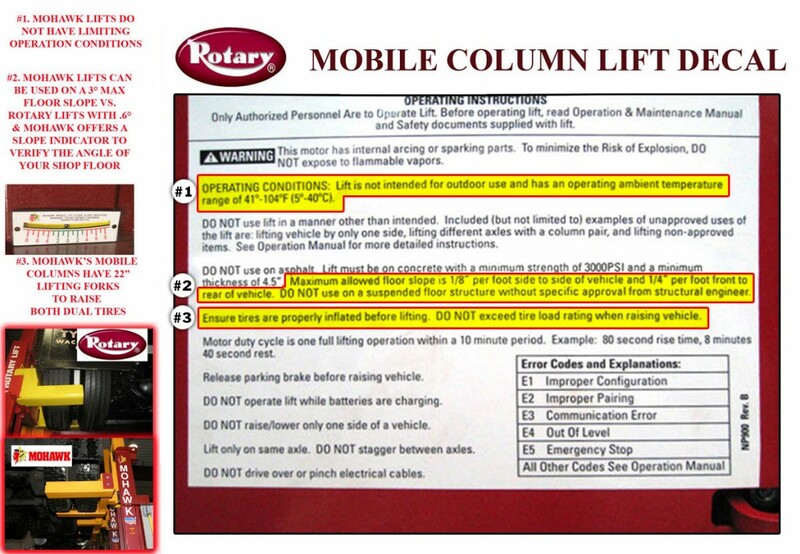 If using the 22” long fork version to raise BOTH rear tires on a vehicle, how much is the column capacity de-rated to? 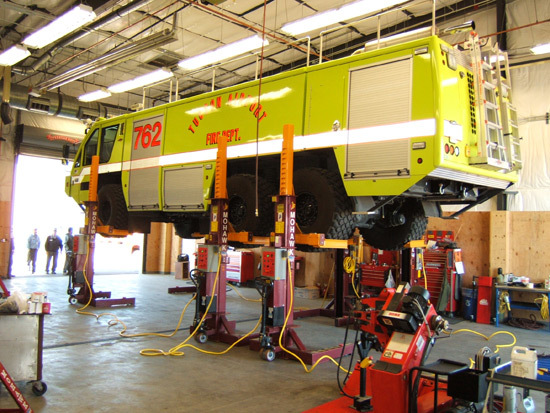 Is it still enough to raise the rear axle if it weighs 25,000 lbs? 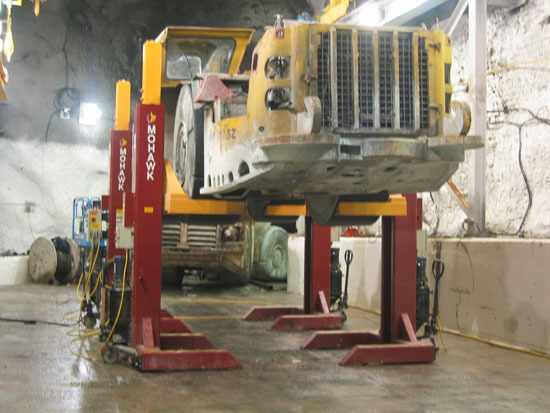 Mohawk’s 22” forks still have a capacity of 16,000 lbs per column while some lift brands decrease capacity by 33% (yet 24,000lb isn’t enough to raise some vehicles with heavy rear ends). 17. Are the high rise jack stands also ETL certified (to maintain the lifts ALI/ETL certification)? If not, then the lift itself is no longer certified. 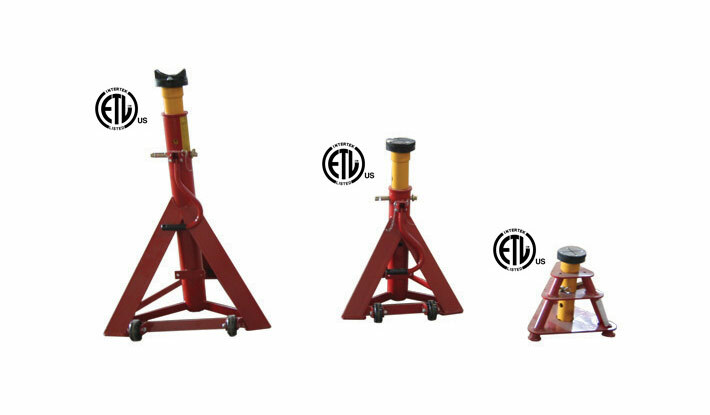 Mohawk’s jack stands are ALI/ETL certified. 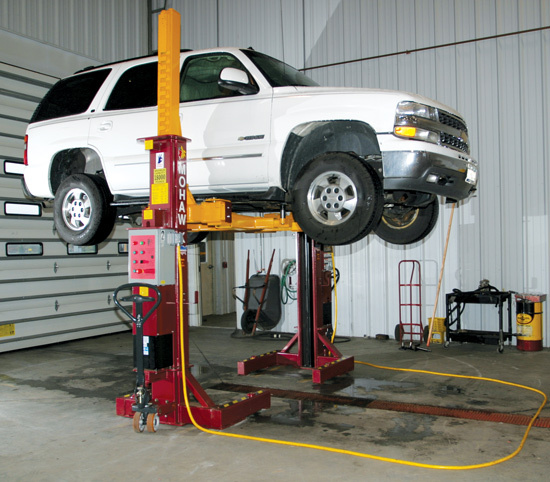 The use of non certified jack stands will void lift certification. 18. Are columns available in several capacities? 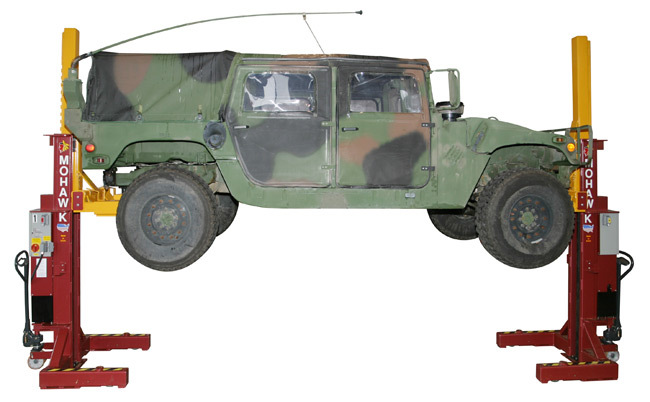 Can different capacities, be used together for heavy ended or specialized vehicles? 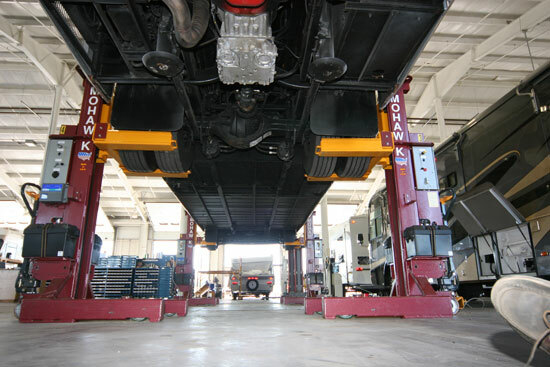 For example 24,000 or 30,000 lb rear columns combined with 18,000 front columns. 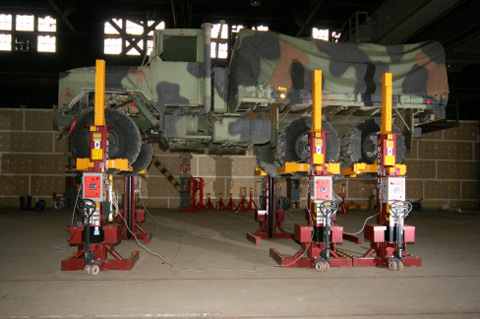 Mohawk MP-18’s can be combined with Mohawk’s MP-24 or MP-30 mobile column lifts. 19. If ever damaged, do electrical cables and communication cables quickly connect to the column or are they hard wired into the lift (requiring longer replacement time or an electrician)? 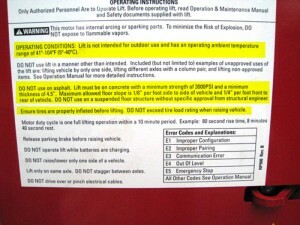 Every lift comes with different warning labels. Ask to see them before you make a lift purchase. 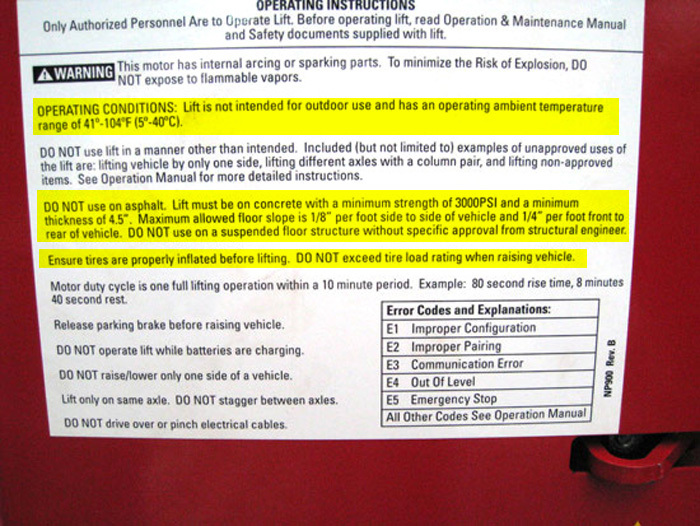 Operate the lift in temperatures below 41° or above 104° F.
Raise a vehicle if tires are not properly inflated. Mohawk understands that lifts operate in many conditions and Mohawk has worked hard to brings users a quality products that fits all of your lifting needs (hot, cold, or not perfectly level shop floors). 20. If a DC Mobile how many lift cycles at full load w/a full battery charge? Mohawk’s DC mobiles allow 31 cycles. 21. Are you sure wireless mobile columns are what you want? 22. Does the lift have operating restrictions? 23. 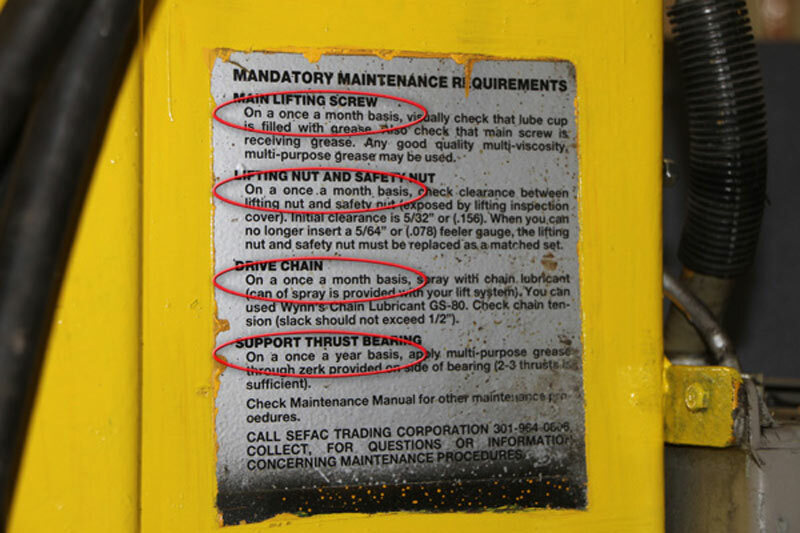 What maintenance is required? 24. 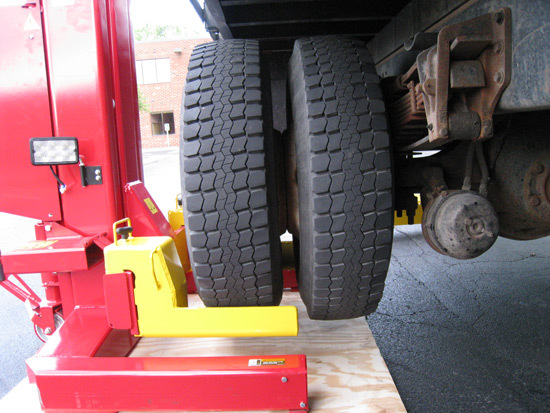 If the truck was made to roll on 4 tires and the rear axle, don’t you think it should be safely lifted by all 4 tires? 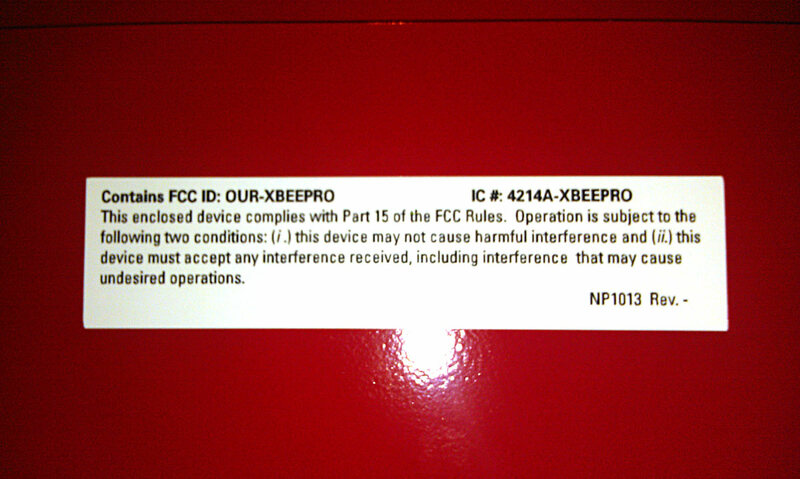 Not per some competitors warning labels.